E.M.I Electronics Ltd, Hayes Middlesex. This is a Type WM3 Cathode Ray Oscilloscope, consisting of an aluminium frame with all but the front panel currently removed. The front panel contains a 3-inch Cathode Ray Tube display with a reflecting filter and graticule to eliminate parallax error and thereby give a more accurate reading. The oscilloscope is a two amplifier design, realised using 5 valves two 6X4, two 6CH6, and one D77. All the valves are miniature types and utilise the B7G base which was adopted in the UK in 1947. The oscilloscope has controls for: focus, brightness, frequency, x and y gain, x and y shift, a large central continuously variable time scale knob, Coarse gain, Time scale, Input coupling, Timebase and Trig, Volt Scale, Supply on/off switch and LF select switch. The oscilloscope has two signal inputs (Dual traces are achieved by beam switching, input 1 and 2 displayed on alternate sweeps, AC coupling only is allowed in Dual trace mode), a sync or trigger gate input, and TSYSNC (Timebase sync) output. Unusually, this oscilloscope also houses a moving coil meter, scaled for -5 to 5 and -15 to 15, corresponding to the voltage scale control. There is also a timebase scale (scaled 0-40 and 0-200) mechanically linked to the central continuously variable time-base control. Unlike a modern CRO the graticule has only 2 divisions, but by using the moving coil meter, the time-base scale and the x and y shift controls, accurate measurements of the waveform can be performed in both amplitude and period. 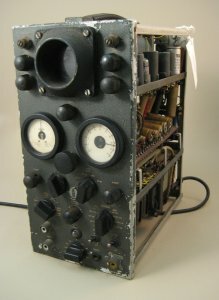 This oscilloscope was built by the electronics branch of Electrical and Musical Industries, EMI. EMI was formed in March 1931. Until 2012 it was multinational music recording, publishing and manufacturing company that was based in London. In 2012 EMI sold its record music operations to Universal Music Group and its music publishing operations to Sony.